The Assiniboine Credit Union River Trail is a Guinness World Record-holding longest naturally frozen skating trail in the world. It begins at the heart of the city, The Forks and managed by the Festival du Voyageur, the river trail is a winter family tradition. 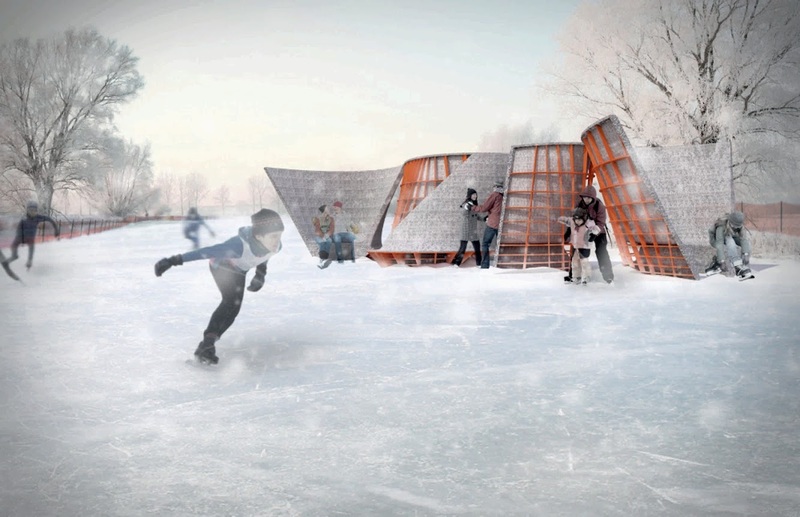 Concept/Strategy This “warming hut” for the Assiniboine Credit Union River Trail is inspired by snow- fences as a northern landscape management structure. However, rather than a barrier, this interpretation of the snow-fence is manipulated to be both a protective space and a playful passage. The linear fence is splayed, warped, and wrapped to create a threshold to the river trail. It serves as a transition from snow and boots to ice and skates. Drift-Pass maintains a powerful dialogue with its environment and its visitors, with snowdrift leaving a trace of its figure on the snow and ice. Response / Occupation in homage to the snow fence, a lattice of Cnc-milled plywood is finished in a bright orange, which signals both safety and warmth. 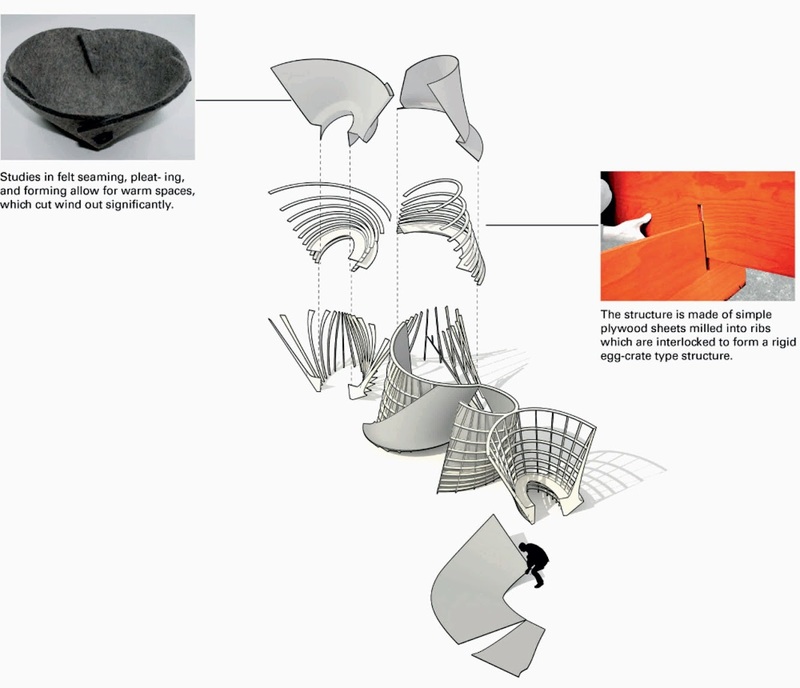 the structure is partially wrapped in industrial grade felt, recycled from woolen fabrics. 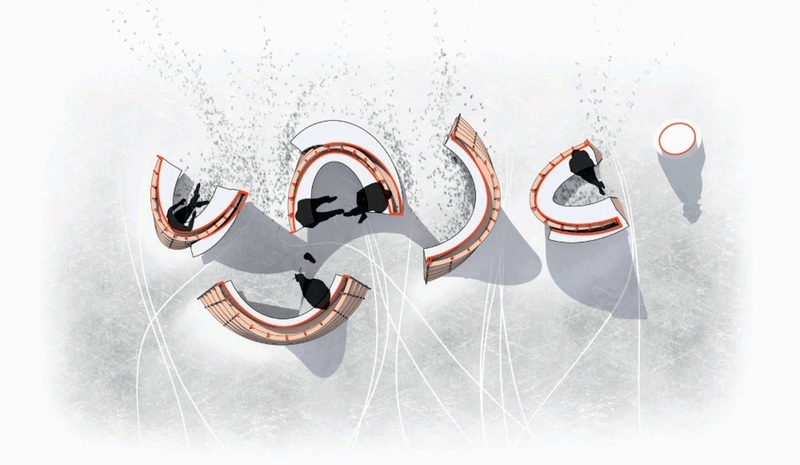 the felt envelopes the interior of spaces to block out wind and to create a soft, warm space of rest and transition. Segments of the fence are cupped to face east or west privileging morning or evening sun exposure or protection from wind to create micro-climates within it. Benches line the interior pocket spaces, as well as some exteriors of structures to make Drift-Pass ideal for warming up, winter play and people-watching. Drift-Pass has a deceptive, shape-shifting reading, it can seem at once as a closed or permeable figure. in plan, it is open and inviting to slalom through and within. in elevation it is more closed and intimate, with a series of small-scale interlocked spaces. Construction Drift-Pass is comprised of two materials: 1⁄2” thick industrial felt, and 1⁄2” thick plywood. the inter- locked plywood structure gives the pavilion its rigidity, while the felt lends it warmth and intimacy.